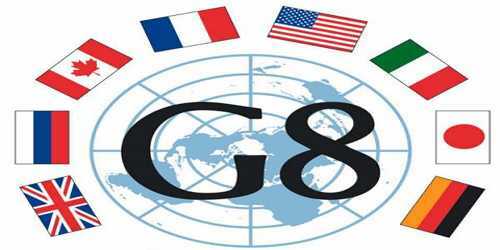 G8 stands for Group of Eight and is made up of leaders from Canada, France, Germany, Italy, Japan, Russia, the UK and the United States of America – that hold an annual meeting to foster consensus on global issues like economic growth and crisis management, global security, energy, and terrorism. The leaders of these countries take it in turns to be president of the G8, with the leader of the host country acting as the president that year. The forum enables presidents and prime ministers, as well as their finance and foreign ministers, to candidly discuss pressing international issues. Its small and static membership, however, excludes emerging powers from important talks concerning the global economy and international security, and as an informal grouping, states have little leverage over other members with which to secure compliance on agreements beyond imposing reputational costs. When the group was formed in 1975, it was known as the G6, comprising France, West Germany, Italy, Japan, the United Kingdom, and the United States. The G6 was intended to provide major industrial powers of the noncommunist world a venue in which to address economic concerns, which at the time included inflation and the recession sparked by the oil crisis of the 1970s. Cold War politics invariably entered the group’s agenda. Currently, the G8 comprises its six charter members, in addition to Canada, which joined in 1976, and Russia, which became a fully participating member by 1998. The EU is a “nonenumerated” ninth member; represented by the presidents of the European Council and European Commission, the EU participates as an equal. The aggregate GDP of G8 states makes up some 50 percent of the global economy. The G8, otherwise known as the Group of Eight, is an assembly of world leaders who meet annually to discuss global issues. Each year, the G8 holds a Leaders’ Summit, in which Heads of State and Government of member countries meet to discuss and attempt to reconcile global issues. Although the G8 is best known for its annual summits, it works throughout the year to tackle important contemporary topics such as the economy and climate change. The G8 discusses and creates global policies. However, adherence to these policies is not obligatory, and other countries can decide whether or not to obey. 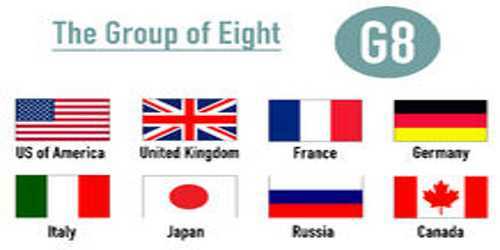 The Group of Eight (G8) is a forum for the governments of eight of the world’s largest national economies as nominal GDP. The forum originated with a 1975 summit hosted by France that brought together representatives of six governments: France, the Federal Republic of Germany, Italy, Japan, the United Kingdom, and the United States, thus leading to the name Group of Six or G6. The summit became known as the Group of Seven or G7 the following year with the addition of Canada. The G7 is composed by the 7 developed wealthiest countries on Earth (as national net wealth) and by the 7 developed wealthiest countries on Earth by GDP, and it remains active despite the creation of the G8. In 1997, Russia was added to the group which then became known as the G8. The European Union is represented within the G8 but cannot host or chair summits.